Call me an iconoclast, but I believe there are better ways to celebrate the Feast of St. Patrick (March 17) than by emptying a vacuum-sealed pouch of corned beef brisket into a pot of boiling water with cabbage wedges. Even if you’re a homesick Irishman, it doesn’t sound like anything to, well, write home about. What is worth writing home about is a Reuben sandwich made with home-cured, home-smoked pastrami. But don’t take my word for it. 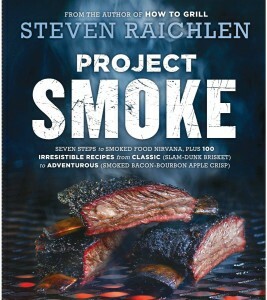 Our grill wrangler/recipe tester, Rob Baas, pronounced my smoked pastrami Reuben “the best thing” he’d ever made at home (he was cooking out of an advance copy of Project Smoke), and Rob does a lot of smoking and grilling. We calculated you’d have just enough time to make your own pastrami before St. Paddy’s Day. Which you will then turn into the most remarkable Reuben of your life. Traditional? No. But a saint who tolerates green beer would surely approve of spice-encrusted, smoke-blasted brisket on rye, right? There’s even cabbage, albeit in the form of sauerkraut. Active hands-on time is short. But the beef brisket flat requires a 7-day cure in a garlic- and onion-infused brine. In my experience, the brine penetrates the meat at the rate of about 1/4 inch every 24 hours. Tip: You can hasten the curing time by injecting the meat with brine after 2 days; insert the needle parallel to the grain of the meat. 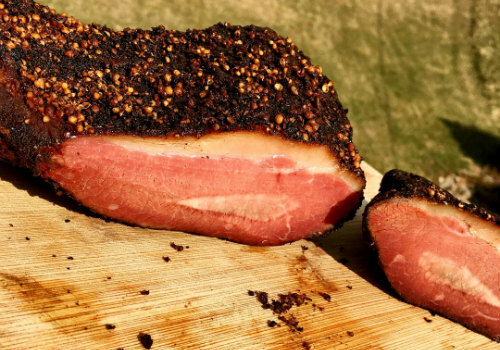 For the recipe and more pastrami tips, go here. Like corned beef, the Reuben was the product of American ingenuity. It’s a melting pot of flavors—cured beef brisket, Swiss cheese, German sauerkraut, Russian dressing, and Jewish rye bread. Legend has it this landmark sandwich was first assembled in 1914 by Arnold Reuben at his restaurant on 58th Street in New York City. If you have time after smoking, let the pastrami cool to room temperature, then slip it into a sturdy resealable plastic bag. Remove the air, then place a grill press on top of the brisket to compress the meat before refrigerating for several hours. You don’t have to do this, but it gives the meat a more compact texture and makes it easier to slice. Before assembling the Reuben sandwiches, thinly slice the meat. You can use a sharp knife, but a meat slicer really comes in handy. 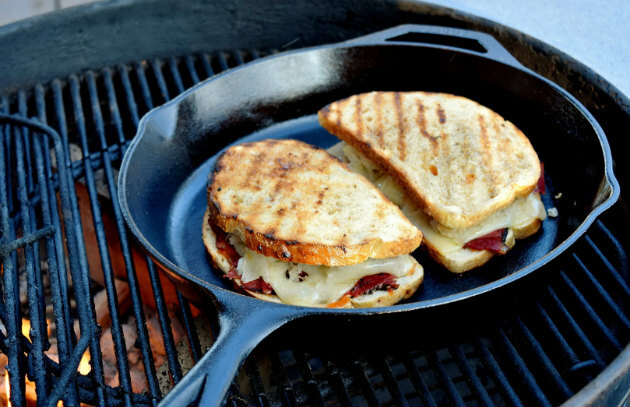 You can cook the sandwich directly on the grill grates, or you can preheat a cast iron skillet or grill pan on the grill before adding the sandwich. Any way you do it, it’s going to be great. 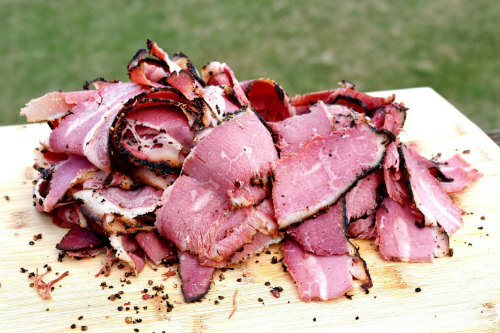 One more thing: For the fabled “luck o’ the Irish,” throw a couple of shots of Irish whisky into the pastrami brine. No doubt St. Patrick will appreciate the gesture.